Kieron Corcoran setup KGC cycles in 2012 after a lifetime in cycling as a one-man support team to his two keen & competitive bike racing children. He coached underage cycling in Killorglin Cycling Club for many years and has always worked on bikes. Since then he has grown his business through a love of cycling and a passion for physical fitness. KGC Cycles sell and service all types of bikes, from fast and light Road bikes, flat handlebar Hybrids and kids bikes to rugged Mountain Bikes. Lots of people have bought bikes with the Bike to Work scheme, have been cycling for a year or two and now want to tackle their first race or Sportive. Kieron combines his physical fitness qualifications with his cycling training to provide group and individual coaching sessions. These are especially popular as preparation for The Ring of Kerry Cycle. With two vans and a mobile service unit KGC are also the ideal place to rent bikes. They have a great selection of Road, Hybrid & Mountain bikes to choose from and they can drop your rented bikes right to your guesthouse and when your day is done they will collect them. 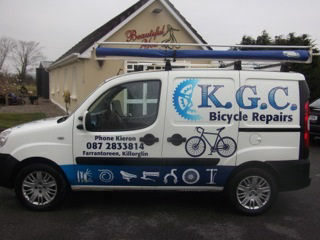 KGC also provide technical backup to The Ring of Kerry Cycle and other local cycling events every year. Kieron races in many local events including Adventure racesand this gives him a great understanding of his clients needs in cycling. Being located near Killorglin on the beautiful Ring of Kerry and Wild Atlantic Way, and with years of cycling the Kerry roads under his belt Kieron can also advise you on the best routes to take. In fact with all rental bikes you get a handy pocket map of some great local routes of varying distance to suit all riders. Whether it’s an epic road climb, blue flag beach or great coffee stop you want, you will find it all within a short cycle from KGC Cycles. for eg. The Gap of Dunloe or Rossbeigh Beach are within 15km of KGC Cycles with Glenbeigh & it’s proposed Green Way only 12km away & of course Killarney & it’s beautiful lakes just over 20km. KGC Cycles are located in a great place for cyclists of all abilities and styles to explore the rugged and beautiful landscapes of Kerry. So for all your biking needs contact us or better still call to us and we would be delighted to chat cycling with you.